Last year at SEMA Classic Recreations showed off a right-hand-drive version of their Shelby GT500CR, and this year they’ve followed that up with a version powered by a Ford Racing Coyote 5.0L crate engine. The company plans to offer the engine, produces 490 horsepower and 429 lb-ft torque, as an alternative option on the GT500CR as an alternative to the vintage 427ci crate engine. 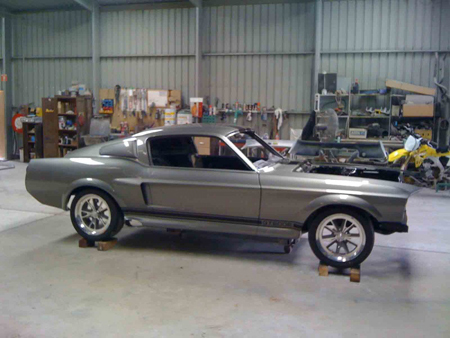 With the exception of the engine this model is a standard Shelby GT500CR, starting with a Dynacorn steel body fitted with a front and rear coilover suspension system, power rack and pinion steering, Tremec 5-speed manual transmission, Carroll Shelby signature rally series 1000 seats and more. You can check out the Coyote-powered 1967 Shelby GT500CR in more detail in the gallery below. This entry was written by by Drew Phillips (Mustangs Daily) and posted here on Friday, November 8th, 2013 at 12:49 pm and is filed under classic recreations, Classic Recreations Shelby GT500CR, News, sema 2013, shelby, Shelby GT500CR. This article was not written by us, rather gathered using RSS feeds listed here. We take no credit for this article. You can leave a response, or trackback from your own site.